Way past Neptune's orbit, even past the Kuiper belt, what is there out there? Have you ever wondered? Watch this video to find out! This poster summarizes the video and makes a great wall decoration! The solar system we call home has our sun, eight planets, all their moons, the asteroid belt, and lots of comets. Outside Neptune's orbit is the Kuiper Belt. An almost empty ring around the sun that has icy bodies, almost all smaller than Pluto, making slow orbits around the sun. But what’s beyond the Kuiper belt? Beyond the fringes of the Kuiper belt is the Oort Cloud. 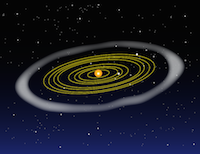 Unlike the orbits of the planets and the Kuiper Belt, which are pretty flat like a disk, It's a giant spherical shell surrounding the sun, planets, and Kuiper Belt Objects. Like a big bubble with thick walls around our solar system. It’s made of icy pieces of space debris the sizes of mountains and sometimes larger. This is where some comets come from. The voyager 1 spacecraft took 35 years to leave the sun's magnetic influence. It’s traveling one million miles each day. At that speed, it will take 300 years to reach the inner layer of the Oort Cloud. And then it will take 30,000 to get through it all. It’s that thick. Find out more about our solar system and what lies beyond it at NASA Space Place!